An early suggestion of the hypothesis of two storage compartments for dopamine came from studies on the rate of disappearance of dopamine from the striatum after inhibition of dopamine synthesis by a-methyl-p-tyrosine. The kinetics of disappearance reported by Javoy and Glowinski  showed an initial rapid decrease in tissue dopamine, followed by an increase in tissue dopamine, followed by a gradual decline of dopamine over a long period of time. These data were interpreted as indicative of two compartments of dopamine, and turnover rate constants were determined for each compartment. As we analyzed these results, we noted that an increase in amount of dopamine cannot be accomplished by shifting dopamine between compartments. The increase can only be explained by some decrement in the extent of inhibition of dopamine synthesis or addition of a new source of dopamine synthesis. To illustrate, the Javoy data are compared with two simulations (Figure 1). Both simulations use the beginning and ending points of the Javoy data, and one shows rate of dopamine disappearance from a one-compartment model and the other the rate of dopamine disappearance from a two compartment model. Clearly, neither solution matches the published data. Figure 1. Dopamine disappearance after inhibition of dopamine synthesis comparing the data from Javoy and Glowinski  to a one-compartment and a two-compartment simulation model. We considered the possibility that the lack of a uniform rate of disappearance of dopamine in the data presented by Javoy might result from a "bad" data point. We compared rates of disappearance of dopamine after inhibition of dopamine synthesis presented in 9 different publications (Figure 2). While in general all studies have very similar results, the few studies reporting on early time points show a rapid rate of loss of dopamine occurring in the first 30 minutes after administration of a-methyl-p-tyrosine followed by a short period with either an increase in dopamine or no change in dopamine, followed by a sustained gradual loss of dopamine. Doteuchi et al  and Paden , both of whom confirmed an early rapid disappearance of dopamine after inhibition of dopamine synthesis, also reported on specific activities of newly synthesized dopamine after administration of labeled tyrosine, finding no evidence that newly synthesized dopamine selectively entered one of two compartments. Doteuchi et al did note that some a-methyl-p-tyrosine is converted to p-hydroxyamphetamine, which might release some dopamine from storage. However, this does not resolve the problem of increasing levels of dopamine shortly after inhibition of dopamine synthesis. While the rapid early decline in of dopamine after inhibition of dopamine synthesis could possibly suggest the presence of a small available dopamine compartment dependent on dopamine synthesis, we conclude that the data are not sufficiently rigorous to support analyses of compartment size and kinetic constants. Figure 2. 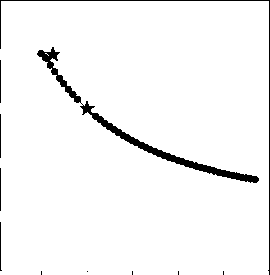 Rate of decline of tissue dopamine after inhibition of dopamine synthesis. Data are derived from: filled circle , open circle , down filled triangle , up open triangle , filled square , open squares , filled diamond , and up filled triangle . synthesized from dopamine by the enzyme monoamine oxidase. As monoamine oxidase enzyme is known to be localized on mitochondria, it seemed unlikely that mitochondria would be associated with a pool of newly synthesized dopamine. Therefore, for our simulations, we chose to have two sources of DOPAC formation: one from mitochondria distributed generally throughout the cytoplasmic pool and a second associated with a hypothesized complex where a fraction of newly synthesized dopamine is immediately converted to DOPAC. This model provided an excellent fit to the data from Gropetti et al (Figure 3) when 20% of newly synthesized dopamine is immediately converted to DOPAC. Figure 3. Ratio of the specific activity of DOPAC divided by the specific activity of dopamine after administration of labeled tyrosine. Stars show data derived from Gropetti  . Circles show simulation output from the model where 20% of DOPAC is made from newly synthesized dopamine. We were interested in the size of the compartment containing the newly synthesized dopamine. Our simulation output shown in Figure 3 has a steady state level of 8.6 dopamine molecules in this compartment compared to 470,000 molecules in the total varicosity. Using simulations with a more populated compartment for newly synthesized dopamine produce simulation output with DOPAC/dopamine specific activity ratios much higher than those observed by Gropetti et al. We therefore conclude that the compartment containing newly synthesized dopamine is very small and is likely part of a synthesis complex. Our simulations indicate that this compartment is so small that it would be difficult to detect in experiments examining kinetics of the total dopamine content of a varicosity. An exploration was done to determine whether there are other evidences for a source of DOPAC by metabolism of newly synthesized dopamine. A comparison of rates of decline of dopamine and DOPAC after inhibition of dopamine synthesis shows that DOPAC disappears substantially faster than dopamine [25,26]. In the study by Soares-da-Silva and Garrett, rate constants are reported of 0.2 per hour for loss of dopamine and 0.5 per hour for loss of DOPAC in the striatum. These investigators argue that this condition can only occur if a substantial amount of DOPAC in brain derives from a newly formed pool of dopamine. We confirmed this conclusion using simulations of a dopaminergic varicosity. Figure 4 shows results of simulations comparing a one-compartment model with the two compartment model with 20% of newly synthesized dopamine being immediately converted to DOPAC. These results show that after inhibition of dopamine synthesis, DOPAC and dopamine disappear at the same rate in the one-compartment model. DOPAC disappears faster than dopamine in the model in which 20% of newly synthesized dopamine is immediately converted to DOPAC. Figure 4. Rate of decline of dopamine and DOPAC after inhibition of dopamine synthesis. 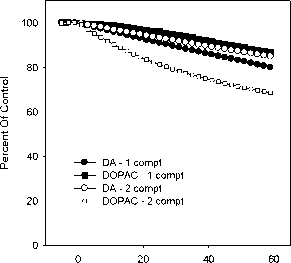 Simulation outputs show that DOPAC declines somewhat more slowly than dopamine when using a one-compartment model. However, DOPAC declines more rapidly than dopamine when using a model in which 20% of DOPAC is made from newly synthesized dopamine. Another hypothesis relative to compartments is that newly synthesized dopamine enters a compartment from which it is preferentially secreted into the extracellular space. One early experiment supporting this hypothesis involved removing cortical tissue above the striatum in an anesthetized cat, placing a perfusion cup apparatus on top of the striatal tissue, and perfusing fluid across the surface of the striatal tissue . When radioactive tyrosine was added to the perfusion, radioactive dopamine recovered in the perfusate increased to a steady state. When a-methyl-p-tyrosine was added to the perfusate, recovery of labeled dopamine declined to zero. This was interpreted as evidence that newly synthesized dopamine is secreted into extracellular compartment. Additional evidence for this concept can be drawn from data showing that rate of decline of extracellular dopamine is much faster than rate of decline of tissue dopamine after inhibition of dopamine synthesis (Figure 5). It is important to be aware that the two measurements shown in figure 5 are not made under similar experimental conditions. Tissue dopamine measurements are from animals that do not have dialysis probes in the striatum, while extracellular dopamine measurements are from animals that have probes in the striatum. We have done extensive simulations of one and two compartments models with newly synthesized dopamine being preferentially secreted. The simulations have led us to identify a condition that must be met in order for extracellular dopamine levels to decline at a rate faster than tissue dopamine levels when dopamine synthesis is inhibited. The rate of dopamine movement from the storage compartment to the compartment from which dopamine is being secreted must be very slow relative to rate of dopamine use. As dopamine depletes from the extracellular space over a time period of nearly an hour in the cat cortical cup experiment and over a time period of hours in rodent dialysis experiments, this requirement means that movement between compartments must be close to zero. However, our simulations show an alternate interpretation of the data. If we include extraction of dopamine molecules into the perfusion fluid in our simulations, extracellular dopamine decreases after inhibition of dopamine synthesis. Figure 6 shows a comparison of the data from the cortical cup experiment described above to a simulation output when 5% of the secreted dopamine molecules are lost in the perfusate and 95% are recycled via dopamine transporter. There is an excellent match between simulation output and experimental data. 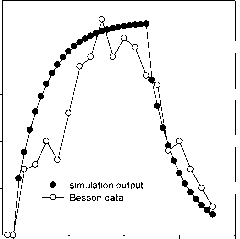 The simulation output also shows an important piece of information not shown in the plot. 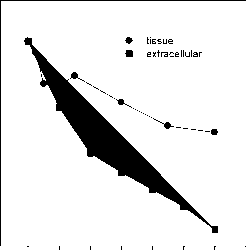 Total tissue dopamine begins declining when the perfusion starts and reaches a value of zero at the same time that the labeled extracellular dopamine simulation reaches zero. Unfortunately, we are not able to find published data where measurements of tissue dopamine have been made under conditions where dialysis has been done after inhibition of dopamine synthesis. There is one caveat that should be mentioned here. While our simulations suggest that experiments measuring extracellular dopamine after inhibition of dopamine synthesis should not be interpreted as evidence for preferential secretion of newly synthesized dopamine, our simulations do not rule out this hypothesis. Data from simulations have been used to determine the potential contribution immediate secretion of newly synthesized dopamine might make to a signaling event. With average firing rates for dopaminergic neurons of 5 per second [28,29], a secretory event occurs once every 0.2 seconds. Our simulation models are using a synthetic rate of six dopamine molecules per varicosity per 0.2 second. It is difficult to determine the number of dopamine molecules secreted. However, various models we have used to explain a variety of different kinds of experimental manipulations used from 180 to 1000 molecules per signaling event. In our most recent models, the number of molecules per signaling event for baseline conditions is 470. At this rate, newly synthesized dopamine could contribute only 1.3% of the signal. This suggests that under normal conditions, newly synthesized dopamine has little contribution to overall dopamine signaling. Figure 5. Comparison of rate of decline of tissue dopamine and extracellular dopamine after inhibition of dopamine synthesis. Tissue dopamine is the average value from the references listed in the legend for Figure 2. Extracellular dopamine is the average value from the three different experiments published by Butcher . Figure 6. Labeled dopamine in extracellular fluid. Open circles show data derived from Besson . Labeled tyrosine was added to the perfusion fluid at time zero, and a-methyl-/>-tyrosine was administered to the cat at time 120 minutes. The simulation model had 95% of extracellular dopamine recaptured by dopamine transporter and 5% extracted into the perfusate. Quantitative information relative to number of tyrosine hydroxylase molecules, potential synthetic capacity, and actual synthetic capacity suggest that dopamine synthetic capacity far exceeds actual baseline synthetic rate. 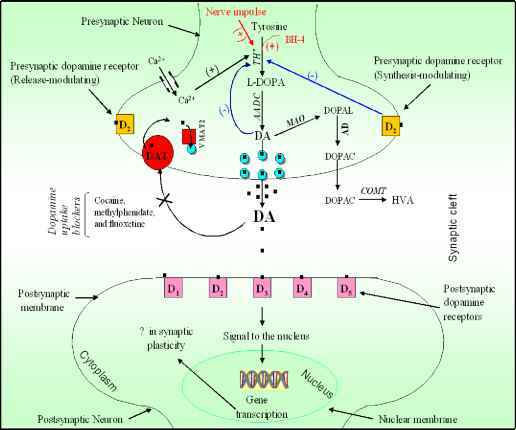 Dopamine is synthesized from the amino acid tyrosine by the action of the enzymes tyrosine hydroxylase (rate limiting) and aromatic amino acid decarboxylase (fast). Striatal density of tyrosine hydroxylase is estimated to be 1.6 microgram per mg protein [30-35]. This calculates to 2.4x104 tyrosine hydroxylase molecules per varicosity (assuming 108 varicosities per mm3 [7,8], and a density of brain tissue of 1). The turnover number for this enzyme as determined in in vitro enzyme activity studies is 1.2 DOPA molecules produced per second per molecule [36-39]. Even assuming that in vitro synthetic rate is roughly 10% of optimum rate under in vivo conditions, this suggests a synthetic capacity in vivo of thousands of dopamine molecules per second. DOPA, the product of the tyrosine hydroxylase enzyme is normally present in very low amounts. In the presence of inhibitors of aromatic amino acid decarboxylase, levels of DOPA accumulate linearly. The rate of this accumulation is commonly used as an estimate of the rate of synthesis of dopamine. The average of various studies is 5x10-9 molar/second [40-45]. This rate calculates to approximately 30 molecules per second in each varicosity, which is the value used in our simulations. This value is far below the 1000 molecules per second potential maximum rate calculated above. Another evidence for a slow basal rate of dopamine synthesis compared to synthetic capacity comes from studies of animals lacking dopamine transporter. Based on rates of DOPA accumulation after inhibition of aromatic amino acid decarboxylase, these knockout animals have a baseline dopamine synthetic rate approximately 2-fold higher than wildtype animals . However, they have less than 10% the number of tyrosine hydroxylase molecules as the wildtype animals. Thus, the knock-out animals are producing far more dopamine with much less enzyme than are wildtype animals. On average, the mice lacking dopamine transporter have 20-fold more production from each tyrosine hydroxylase enzyme molecule. This suggests the presence of a large reserve synthetic capacity in the wildtype animals.